Nothing tastes better, is more satisfying, or says ‘I Love You!’ better than a bowl full of spaghetti and meatballs made from scratch. I have not yet found a restaurant meatball that tastes as good as homemade, and I have done extensive research. This is a weekend cooking event, but the upside is that you will make so many meatballs, that you can freeze enough for mid-week meals in the future. I make this for Sunday dinner, then line up another meal of leftovers for Tuesday or Wednesday that week, and usually freeze 3 containers of sauce and meatballs for later (every other week for 6 weeks you will have dinner, out of this one large pot of sauce and meatballs). Chop the onion and sweat it in a small pan with 1 tbsp of the olive oil, salting it right away to help pull out the water. Heat for 3 or 4 minutes so it becomes tender not browned. Put the meats in a large bowl, add in the eggs and the breadcrumbs. Grate the cheese and add to the bowl with the seasoning and the cooled onions. I don’t put salt in the meatballs, I salt them on the outside instead. Even though I have been told real cooks don’t use garlic salt, I like to add it to the meat instead of fresh garlic. I hate biting into a chunk of garlic in my meatball. Wash your hands and get in there and mix! No other tool will do, your hands are the best way to get all the ingredients combined. Then start making the meatballs. My husband loves small ones, I like them big, so sometimes when I am feeling generous, I make them small for him, this time I went big. To make the meatballs, mold a portion of the meat together, then roll between your palms into ball shapes. Salt the outside of all the meatballs once you fill a plate. Then start on a second plate doing the same, don’t forget to salt all of the meatballs once you fill the second plate. Secret: I used to start cooking the first batch of meatballs while making the second batch, always in a rush, I acted like a multi-tasking kitchen ninja. It’s the journey as much as the destination while committing to an afternoon of weekend cooking. Finish making the balls, before starting to cook – or you may burn them and it won’t be as fun. 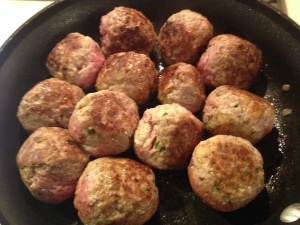 Meatballs can be baked, but I prefer Grandma’s method of cooking the meatballs – in a skillet with olive oil. When you cook them in a skillet you get those lovely browned flat sides, there’s nothing like it! You are creating caramelization all around the outside which adds such flavor. I am sure it is a little more figure friendly to bake the meatballs, but do you eat meatballs to lose weight or be comforted? Use tongs to keep spinning the meatballs (In the beginning I use my hands to turn the meatballs, but at this point I have asbestos fingers!) Goal is to have about 3 sides browned, then dump them into the sauce to finish cooking through. You can use either a quick sauce or a weekend version of sauce. Whether you make small or large meatballs, they should finish cooking completely in the sauce as it simmers over medium heat with the lid on it, stirring frequently for half an hour. Tip: My single most delicious bite of food, is that first meatball from the pot. I used to steal it from my Mom’s pot of sauce everytime. How else can you make sure they are cooked all the way through anyway? You can leave the meatballs in the sauce over low heat for another hour or two if you need to, stirring occasionally. The flavors will just continue to blend together and it can buy you some time to finish other tasks. Package up 3/4s of the meatballs and sauce in containers, let them cool a bit, then label the lids with the date (use masking tape if you don’t have actual food labels) and put into the freezer for another week. I portion out enough for 1 or 2 meals in each container. Put that dinner’s sauce and meatballs into a medium sized pot and cook the pasta. Once the pasta almost al dente, drain it and pour drained pasta into the sauce and meatballs to finish cooking and blend it all together.